New York City presents an opportunity for creativity at all times including dull subway rides. I’m currently teaching myself Unity by reading through Unity in Action and as an initial finished project, I’ve built a card matching game that is covered in the fourth chapter of this book. I decided to utilize the dictator portraits that I’ve been creating for a print and animation series titled “Drunk with Power”. 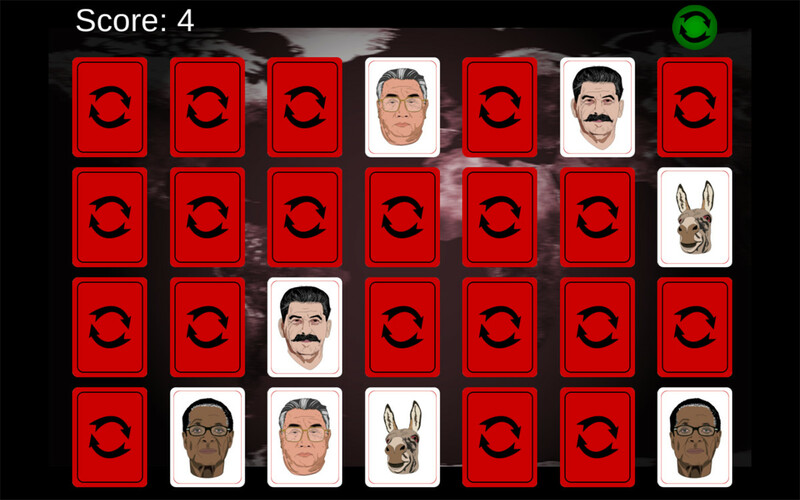 The game is available online, so test your memory by matching the 14 dictators illustrated onto the cards in the game “Amnesia”. In case you are not able to identify some of the portraits and would like to know who they are, the illustrated dictators are: Somoza, Ortega, Stalin, Putin, Idris, Gaddafi, Batista, Castro, Smith, Mugabe, Hirohito, Kim Il-sung, the GOP and the Dems.